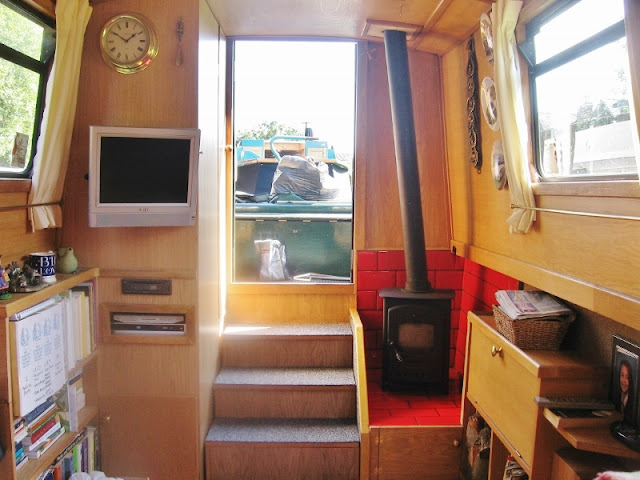 The death of my husband and my own ill health forces the sale of our lovely home, NB Valerie. 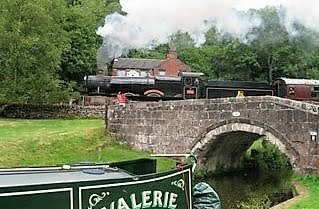 Built by Hamilton Bespoke Narrow boats, she went into the water in January 2006. We have been her sole owners as live aboard continuous cruisers for 12 years. NB Valerie is 58 feet long, with a semi-trad stern. Serious inquiries only. All reasonable offers considered. Asking £44,500.00 ONO. I am willing to negotiate with the right buyer. I want NB Valerie to have a new owner or owners who will love her as much we have. E-mail me at biggsbiglove@gmail.com. Currently cruising in Nantwich, Cheshire. 6 mooring pins, three hammers, four nappy pins, and one set of mooring chains. Two bow mooring ropes--one on each side, one stern mooring rope and two mid-line ropes--one for each side. Extra parts included: second Shurflo water pump, parts for Ebispacher, 7 oil filters, engine belts, six tubes of stern gland grease etc. 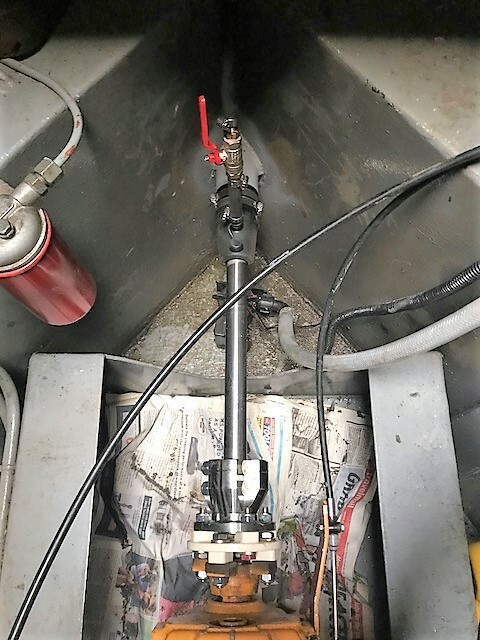 Extensive tools to stay with boat, including five year old Husqvarna 17 inch chain saw and sharpening set; brand new log splitter axe and sharpening stone, hammers, Dremel set, sockets, wrenches, screwdrivers, etc. 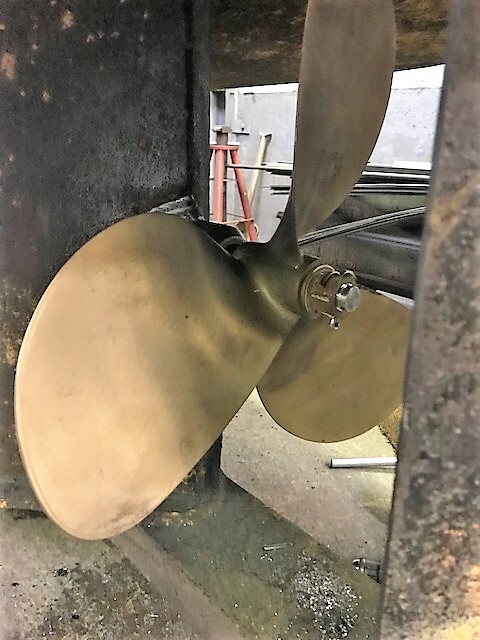 Out of the water for a replacement of the cutlass bearing and a new larger prop in January 2018, a marine engineer at Aqueduct Marina examined the hull closely and pronounced it in excellent shape. She comes with a complete list of all work done and repairs with completion dates, all past BSC certificates, original boat paperwork, and all instruction manuals for on board appliances and boat parts. 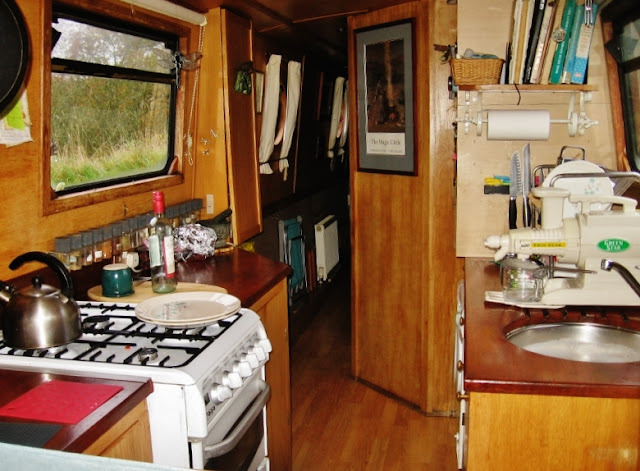 Pots, pans, silverware, dish and glassware, immersion blender, hand blender, cookware and many linens stay with boat. You could simply pick up some groceries, come aboard, turn the key and cruise off just as you do in a hire boat! We were in the middle of painting NBV when Les received a terminal cancer diagnosis. Like a lovely lady of a certain age, she needs a bit of slap as the Brits call makeup. The paint job needs to be completed and all the paint, white spirit, brushes, rollers, Fertan rust converter, primer, sanding paper and two sanders come with the boat. This is an opportunity for new owners to personalize her or even change her name. 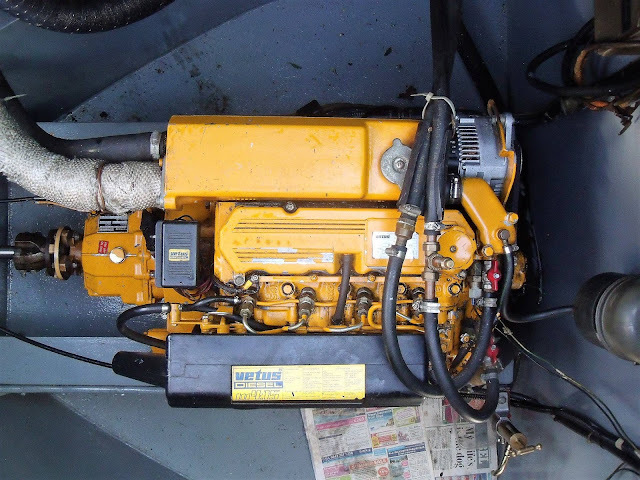 All the crucial bits--the engine, inverter, water tank, hull, etc. 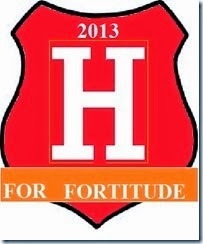 are in excellent nick. 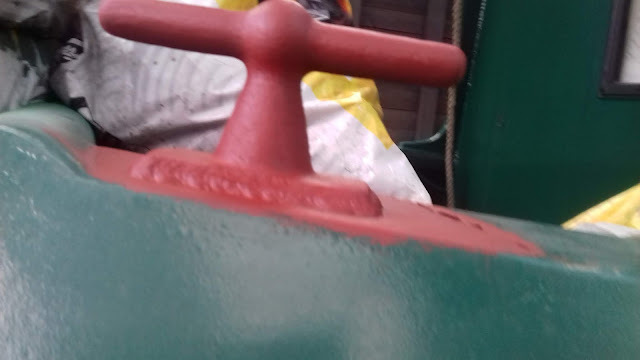 A look at the brand new cutlass bearing and waterless stern gland installed in January 2018. Close up of the Vetus 33 HP engine. NB Valerie has a freshly cleaned and painted engine bay and brand new aluminium checker plate engine bay cover--easy to lift and is brilliant at keeping water out. The engine bay is always dry. The oil and filters are changed faithfully every 350 hours. A new larger prop means NB Valerie is ready to handle both canals and rivers with ease. Freshly blacked in January 2017 with brand new sacrificial anodes (4). NBV does have a galvanic isolater. Shot of my bike on the newly installed bike rack, January 2017. We had two additional T Studs mounted on either side of the bow to make it easier for short people like me to moor up. I never could reach the T stud out on the point of the bow! 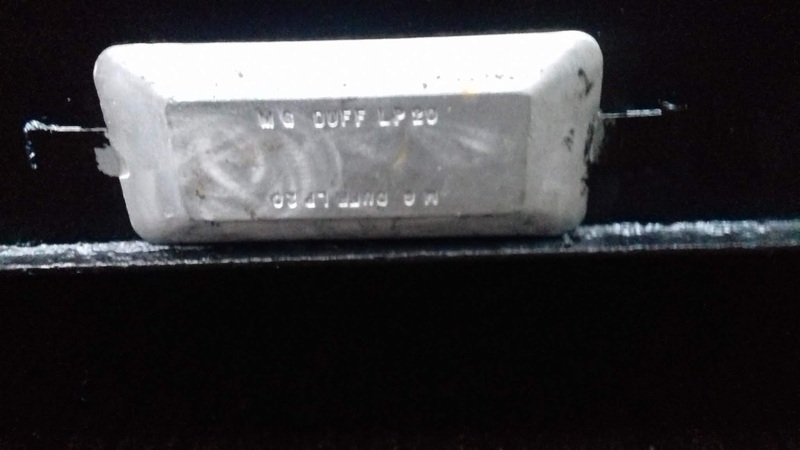 All mooring ropes, fenders, and fender ropes were replaced in August 2017 and I added mooring cleats to the fender ropes to make it quick and easy to adjust the fenders when mooring up. Looking towards the bow from the chairs in the Saloon. The TV has been replaced with a new 22 inch HD telly with built in DVD player and Freeview. the stereo has been replaced with a new Pioneer stereo. Les built new stairs for my short legs with storage underneath each step, a larger, longer hearth with new tiling so live coals would no longer fall on the floor. There is storage under the hearth for the coal bucket and two spacious closets on the left for shoes, boots, cans of paint, axes, coats, grocery trolley, and outdoor sun umbrella! It took me four months to design this closet with built in man drawers and it took Les three days to build it! All the tools in the picture stay with the boat. A close up view of the new Solar panels installed August 2017. This set up makes it easy to clean and paint underneath and the panels clear the mushrooms vents tilted in either direction. In summer you can go for days without starting the engine. 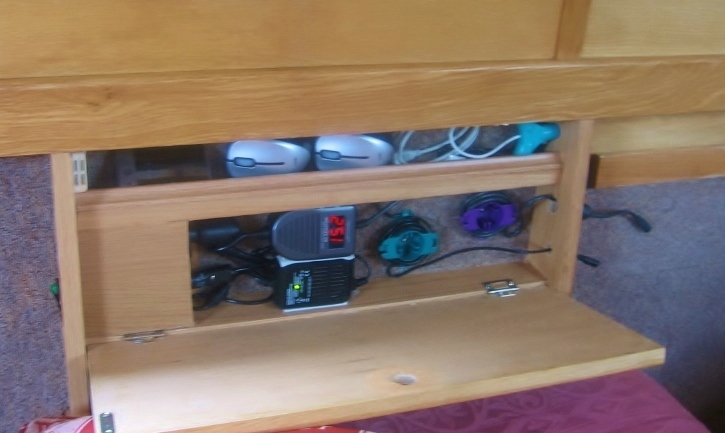 On a sunny day you can turn on the inverter and wash clothes on sunshine without touching the battery charge! 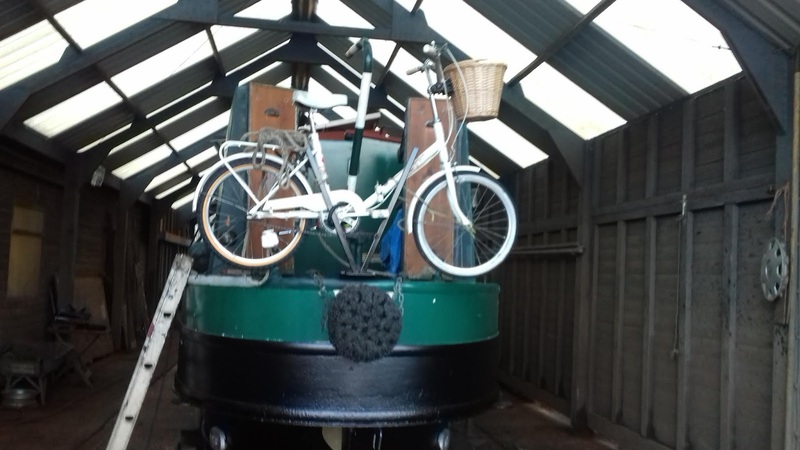 In winter you can leave her moored up on the towpath for a few days and come back to find fully charged batteries and an engine that turns over on a dime. 20 inch thick firm Memory Foam mattress with Cool Blue technology. It is the most comfortable mattress I've ever slept on. It is in pristine condition. It measures 6 foot by 4'6" wide. The bed all made up, looking from the cabin down the hall past the bathroom and into the galley. The bed has been modified to pull out into a 6 foot by 6 foot cross-bed. Standing by the dinette and looking into the galley. Airhead Marine Composting toilet! Freedom forever from Elsan and pump outs forever! If you prefer to use the chemical toilet stored in the engine bay, it will take you less than five minutes to unscrew two wing nuts that bolt the composting loo to the floor and lift it out of the bathroom. The chemical toilet will simply sit in its place and require emptying at an Elsan disposal once a week. Interior of the roomy medicine cabinet in the bathroom. 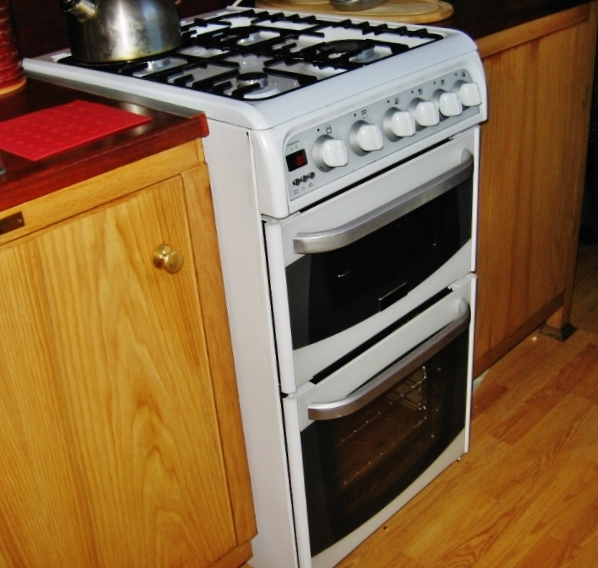 Lovely Cannon home cooker range. Brilliant and handles anything you can imagine cooking, baking or grilling. Close up of Shoreline 12 Volt Freezer/fridge on top of the counter! No more squatting down a half dozen times a day or lying on your belly in order to see what is in the fridge! The Candy washing machine is mounted below it and connected directly into the boat's hot and cold water system with knobs to turn to change from one to the other. This decreases the load on the inverter and batteries from 3200 watts to 2600 watts on starting. Top and bottom of dish and glassware cupboard Les built which is amazingly streamlined. Dish and glassware stay with the boat. Condiments cupboard at the end of the counter on the cooker side of the galley. 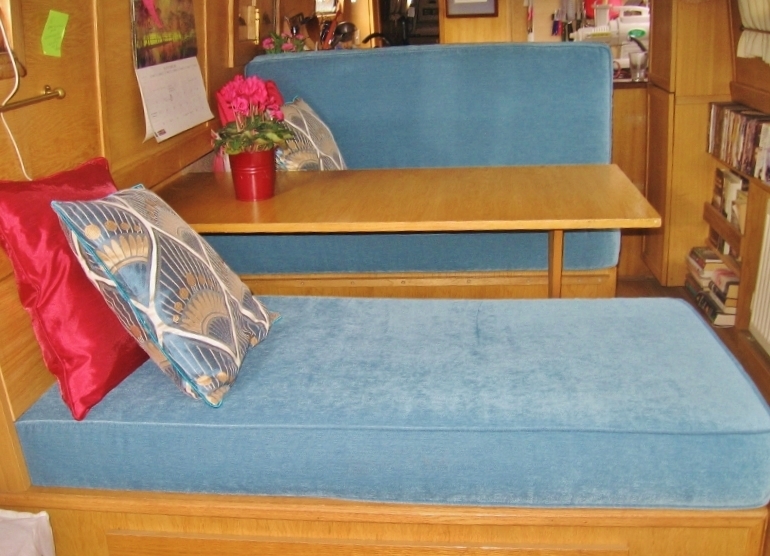 The dinette folds down to a double bed. There are two large drawers underneath the near seat and the farther seat lifts up for storage underneath. The computer charging station is hidden behind those pillows nearest to us. This hidden charging station will charge two computers simultaneously. I realize this post might appear to be an abrupt about face in contrast to my previous post titled Never Give Up but I assure you it is rather a continuance of the idea. It has been a very tough two years since my Best Beloved Les died. I had to try life on my own on our boat and give it my best effort. Sadly there were fences, walls, and impediments I could not have foreseen waiting for me. In the States I never had trouble finding a job. I have a university degree, twenty five solid years of experience working with students, and excellent references. None of this has made any difference over here in Britain. I've looked for work for a year and the only work I could get was waitressing. Now I don't mind waitressing and I've done it before--when I was 19. But I am 61 now with health issues and a financial need to earn more than minimum wage so sadly it isn't going to work out for me. When I married Les and moved here I had two auto immune (AI) diseases: Sarcoidosis and Osteoarthritis. I managed the Sarcoidosis with supplements of melatonin shipped from the States since I could not get it here without a prescription and even then no one would prescribe enough to actually stop Sarcoidosis from progressing. When Les' cancer began to travel and we had to spend hundreds of pounds every month on supplements to fight it, I quietly stopped taking Melatonin as the cost for shipping it from America was ridiculously high and I never told Les. Sarcoidosis has now made my lung tissue brittle and it is harder to breathe. Now I've developed Crohn's disease and all three diseases are adversely impacting each other. They are incurable, chronic, and progressive. The arthritis in the first digits of my index and middle finger on my right hand now make it very difficult and painful to pull on socks, pull up trousers, tie shoes and mooring ropes. My children have been worried that I might fall ill over here and end up in a care home and they would not be able to get me back To the States, near them, so it is time to close this chapter of life, square my shoulders, turn and step forward to rebuild my life anew once more back in the States. I love this boat. It has been my home for over seven years. She brought Les and I together, and his heart and soul is in every bit of her. She was Les' "other" baby. She deserves a new owner who will tart her up and make her shine with love and joy; in return she will give many decades of comfort, security, and freedom to the right buyer. Gosh a lot has happened in the last few weeks! 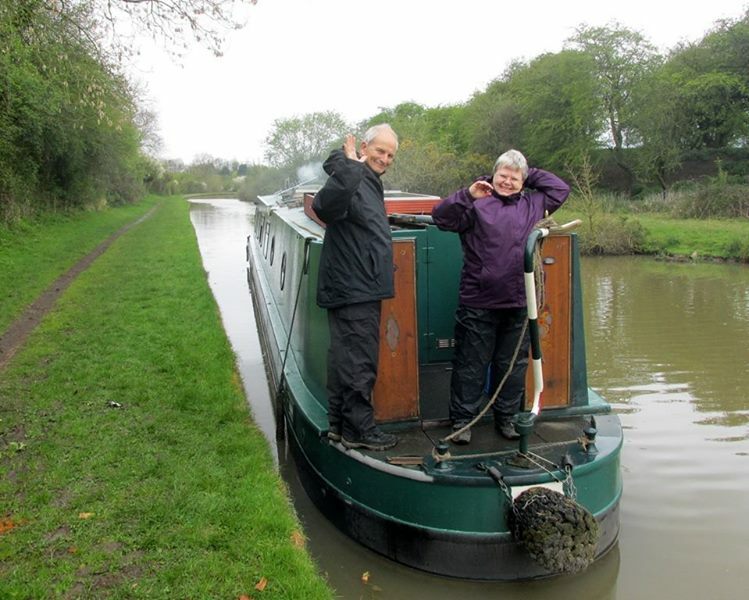 I began moored in Nantwich for two days and was treated to a visit by my lovely friend Susanne King. her boat is at Aqueduct marina. Sadly Susanne's husband Peter died just over two months ago in a hospice in Winsford. We connected because I started a closed group called Widows on the Cut, for women on boats who have lost a partner, spouse or significant other and need a safe, confidential place to share their their feelings and emotions and know they will receive compassion, loving kindness, and understanding from other women literally in life's same boat. Susanne is Danish, Peter was Welsh and they lived half the year in Kenya and spent the summers on their boat cruising the British canals. Meeting Susanne has been a blessing for me, as I can speak candidly about my grief with her and know she gets it--because like me, she is in it. We had a lovely lunch aboard NB Valerie and her presence brightened my day. I cruised back out to Hurleston and the weather deteriorated. First it was blustery winds and warm rain--decidedly a departure from usual late October weather. The shortened days, the lack of sun, and the depressing fact that November was one week away and I would hit the one year mark of looking work--unsuccessfully--made me feel suicidally depressed. I just wanted to give up and throw in the towel or more accurately get pissed and throw myself in the canal. But then a series of things occurred: a group of women came by in a flotilla of canoes. It was lashing with rain, and the wind was forming waves on the canal and yet here were these intrepid young women refusing to let the crap weather keep them from learning to row a canoe and enjoy nature--in all her vicarious moods! Women out canoing in the rain!! Brits don't let the weather interfere with fun--much like Alaskans that way! It really was chucking it down! The same stretch later on after the rain cleared off. Next a package arrived for me at The Laundrette. It was from the Heck Sausage Company in Yorkshire. I had purchased a package of Heck brand Smoky Paprika Chicken Sausages. I love heck brand sausages because they contain no rusk, use fresh herbs and spices, and are 98% meat--like U.S. sausages. I was thrilled to my boots to find a chicken sausage that I thought might be close to my beloved Spanish Chorizo sausage that I use in Three Sisters Chicken and Chorizo Casserole and in my homemade Minestrone soup. I bought Aidell's chicken Sausages from Costco back in Washington State and loved them so I was very excited. Sadly the Heck chicken sausages were not for me. They were low fat and consequently the texture was more like plastic then juicy, flavorful sausage. When I ordered groceries again I took the opportunity to leave a less than favorable comment about the product based on its texture, on the Ocado web site. Apparently the store passed my comment on to Heck and I received a lovely email from a woman named Claudia who works for Heck and was sad to read my review. She wanted to send me a check for a refund! It was only £3.00 but what customer service!! Instead of an envelope with a check I received a package with a hand written letter from Claudia, a refund check for £3.00 and a lovely apron! I have since tried Heck's full fat chicken sausages and they are delicious, and of course their pork sausages are divine. Sadly I can no longer digest Pork or Beef so I cannot enjoy them, but I encourage everyone else to give Heck brand sausages a try. The weather now took a cold and typically Autumnal turn with ground frost and nightly temperatures plummeting to -1/28F. No more going outside to start the engine withhold a coat, hat and gloves! Time to pack away the summer clothes and fill the wardrobe with winter wear, including my favorite cold weather trousers from Duluth Trading Company in the USA, made of fire hose canvas. They are thick, tough as old boots and more comfortable than jeans, with pockets for knee pads, a loop for a hammer or a windlass, and lots of pockets and a back waist that rises to close the gap between shirt and pants. Their clothes are made for people who work outdoors and need tough, lasting and essentially comfortable gear. I love sweater weather!! Mine are washed, dried, de-pilled and folded on the shelf along with thick sweatshirts and long sleeve turtle neck tops. My black down coat and Les' green down jacket are back in service again; I wear my coat to town and Les' jacket for cruising and boat chores. October 31st arrived and for me as a Witch it is Samhain and a sacred day. 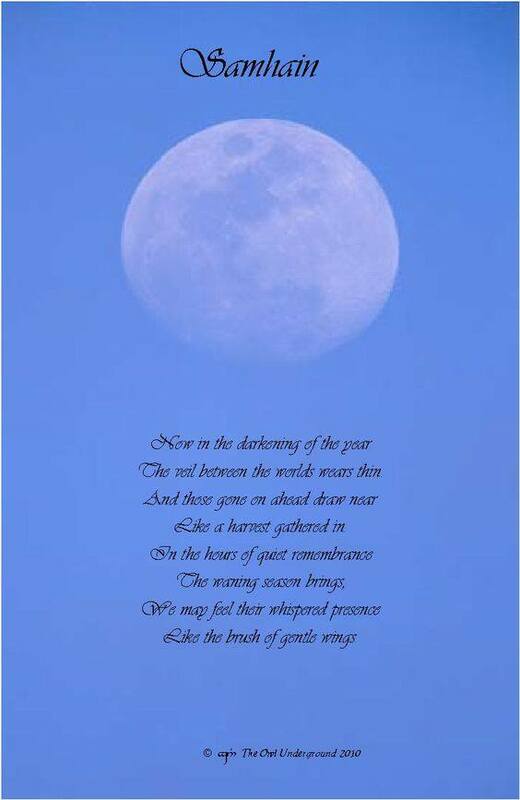 It is our day of remembrance of our beloved dead, and it is New Year's Eve. We believe the veil between the world of the living and the dead is thinnest on certain days and nights of the year and this was one of them. We build altars in memory of beloved dead, engage in ritual to allow their spirits space to return and visit if they so choose and usually we have a meal of their favorite foods and set a place at table in their memory. Since I was on my own my ritual was very low key, but I felt Les' presence. The hairs went up on the back of my neck at one point, and I felt surrounded by power and love. Spent with emotion, I turned in about 11 p.m. My phone woke me at 12:30 a.m. with a ping telling me I had a text message! Someone had logged in to Tutorful, the tutor web site I am listed with, and was requesting me to tutor them! I answered the next morning and we agreed to meet at Nantwich Bookshop and Coffee Cafe near the village green. This is the 435 year old building in which I work! "Yes I am," she said with a bright smile. "Well then you also know who I am!" "Yes I do. It is good to see you and in fact I wondered if you were still looking for work?" "Could you come in some time later this week and work for a couple of hours in trial so we can see how you handle things?" "I would love to. What about Wednesday?" "That would be perfect, " Denise replied as she flipped through her wall calendar and wrote my name down. The upshot is that I went in for a trial and worked for six hours. At this cafe everyone is trained to do everything: pot washing, plating up orders, barrista, waiting tables, and cashiering. That way anyone on the clock can be slotted in wherever they are needed most. Tips are divided equally between all the staff as well so it means we are a cohesive team working together to provide good customer service no matter what we do--even washing dishes. So now I am finally employed, albeit part time which is a good thing at the mo as I have not worked a physical job on my feet for six hours since I was nineteen! I've had desk jobs since my university days. I stopped in to Marks & Spencer for a Saturday paper (they a re located right next to the bus station and library and it is easier to nip in there for a paper then walk all the way over to Morrisons for one) and I was chatting with the grocery clerk. 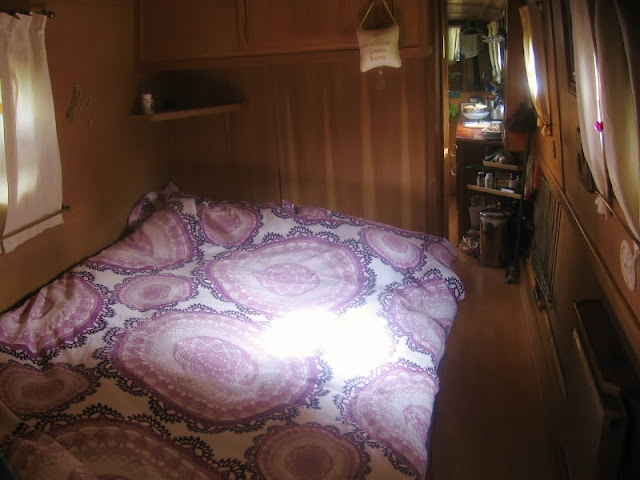 Her face lit up when I said I lived on a narrow boat. "Oh we just bought ours and she is going into the water tomorrow at Aqueduct Marina. My husband and I are gong to live on her and we are so excited!" Her name is Linda and her boat is NB Water Colour so if you see them about give her a big, friendly wave. After eight days at Hurleston, preparing for winter and putting draft plastic on the windows, I cruised back in to Nantwich in time for the winter mooring times to begin, filled with water, dumped the rubbish and moored up near the ramp by the stairs down to the Welsh Lane. The cold weather disappeared and warm, balmy weather swept in from the southwest! How warm you say?? So warm I had to let the fire go out in the boat! So warm I had to switch back to my rain jacket! So there you have it!! me and Ma Nature are both very mixed up about the weather these days. One morning recently I was out walking my rubbish to the bin back at the service point and everywhere I looked boaters were popping in and out of hatches and engine bays. Nothing like surprise helping of warm, sunny weather to get those last minute boat chores completed. An elderly gent was standing on the towpath, tobacco pipe in hand looking at his boat NB Solitude. We got to chatting and before you know it we had exchanged histories, names, and opinions of some of the trials of the world. We even got round to loos!! His name is Roy and his wife is Carol. She was out that morning, but I look forward to meeting her. After dropping my rubbish in the Biffa bins I decided to stroll down to the Canal Centre and share my good employment news with several women there whom I know. Margaret and Lynda who work in the Chandlers were both out that day. I sauntered around the corner to the Convenience Shop and nipped in to say hi To Sharon, the new owner. 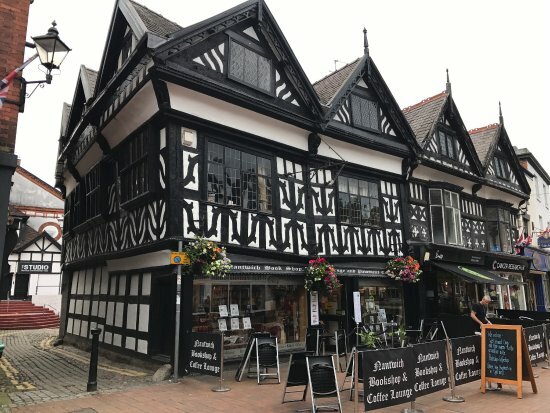 If you haven't been in there, please make sure you stop in when you come through Nantwich and stop to fill up with water, dump your rubbish or empty your Elsan and say hello To Sharon. If you just need to replenish some tinned goods, fresh veg, milk, bread, eggs, and maybe some frozen food between large shops then you will everything you need. It will save you making the one and a half mile round trip walk into town. Sharon knitting as she waits for customers. She didn't realize I was taking her picture. Drop in and say hello to see her thousand watt welcoming smile! Sharon's daughter owns The Laundrette there in the Centre, That's where I get my mail. 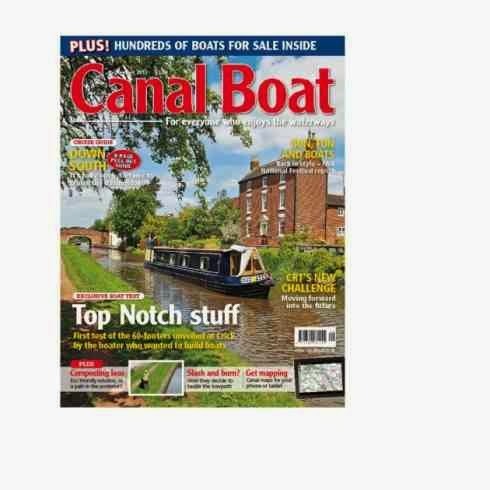 Since Sharon took over the Canal shop it is ever so much cleaner, far more organized and has a really solid stock of the kind of things boaters are using. She even carries lactose free milk! Being a knitter, Sharon has yarns and collectibles for sale in her shop as well. This is one more canal side shop we should support so at the very least pop in and grab a candy bar!! You won't regret it.